It is never too early to teach your children about the importance of recycling and the best way to teach them is through fun crafts. I'm sure we all have thrown away a lot of cardboard tubes (for example, toilet paper tubes, paper towel tubes or wrapping paper tubes). There is so much that can be made from cardboard tubes. You can make a fake candle stick display, make a pair of fake binoculars, make a castle (along with a cardboard box) or even an animal. Cut 1/2 inch rings from a paper towel tube.To make it look really nice, wind each ring with white or colored yarn, as pictured in figure 1. Take a small box and fill it with seeds, beans, or popcorn kernels (in a bag inside the box). Cut a small home in the center of the box....push a paper towel roll into the center of the box. With all the seeds or beans, the box should be stable when throwing the rings at it. 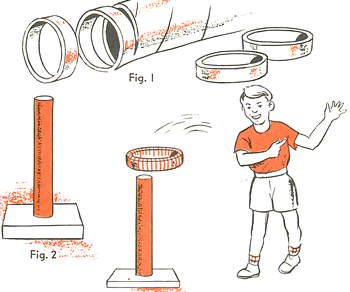 Young children will love to pile the rings on the cardboard tube, while older children will like to toss the rings over it for a game. This is a great craft for organizing your office supplies. It would be even better to give as a gift to Mom or Dad for their desk, maybe for a birthday or maybe for Mother's Day or Father's Day. Find a sturdy cardboard tube. Trace the circle end a few times...a bit bigger than it actually is. Then cut the cardboard roll in half, length-wise, as seen in the picture above. Then those circles in half -the ones that you just traced. Now use these half circles to close the ends, and to make dividers....just glue them to the edges. Use toothpaste caps to make little legs for your desk organizer. Paint your organizer a beautiful color, if you want to. 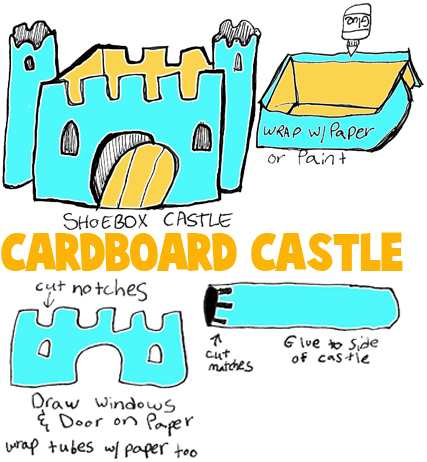 This is an easy castle making craft for kids to make. Just basically wrap a box and paper towel rolls with paper. For an added touch you can use a marker or paint to draw in little stones on the side of the castle and paper towel rolls. Cut rectangles at the top of the paper towel rolls and the box as well. Cut out decorative windows and the door. Glue the decorated paper towel rolls to the side of the castle. And that is all there is to it...you are done. Add your own decorative touches to make it special to you. Cover a toilet paper roll with white paper and glue it on. Then make 's' shaped zig-zaggy like shapes all over the paper. Add yarn to the back for a tail. 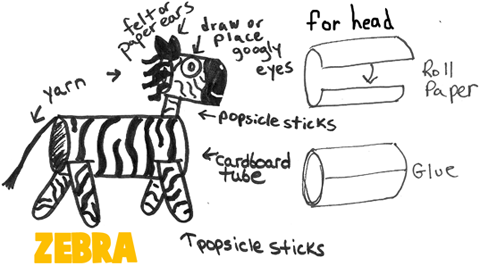 Then break 2 popsicle sticks in half and attach them to the body by making 4 small cuts in the bottom of the tube and sticking the craft sticks inside the zebra body. To form the head, roll a piece of paper together and glue. Add zig-zags to the face too...place a googly eye on it and then draw the snout black. Add ears with felt or black paper...just make 2 oval or tear drop shapes. Add a yarn main in the back. Cut a tiny cut at the back-bottom of the head to attach another half-popsicle stick neck. Place it in the front of the cardboard tube by cutting a slit and attaching the neck and head to it. Draw the rest of the stripes on the zebra and you are done. Look at all of the cool looking plants you can make with a cardboard tube (such as half a paper towel roll or a toilet paper roll). Firstly, cut a popsicle stick in half and then glue them to the bottom of the cardboard tube. Now you can balance the figure standin up. Place a cleaned out egg shell on top of the cardboard toilet paper roll. Decorate the figure with all sorts of items. You might want to first paint it. Then paint eyes, noses, and a mouth. You might want to wrap it in a piece of fabric from an old shirt, or use felt to make a coat or pants. It is all up to you. After decorating the figure, then put cotton into the empty egg shell. Then drip some water in the cottom and place the cress seeds on top of the cottom. Now all you have to do is put it in a dark place and forget about it for a few days. Go back every so often to see if anything is growing. If you see shoots coming out of the cotton...then it is time to grab this character and put him / her / it in front of the window to get some sunlight. Every day, drip a few droplets of water onto the cotton. That is all there is to it. Make all sorts of characters and give them to loved ones and friends. For this craft, you will need 2 tubes (from wax paper or paper towels) about 1 1/2" in diameter and 6" long, black crayons, duct tape or tape that is about 1" wide, and string about 25" long. Bind cardboard tubes together with tape so that two ends are 1/2" to 1" apart and the other ends are together (see sketch). Color. Punch holes, 1 in each tube on outer side. Fasten string in holes for carrying around neck. These bracelets are very easy to make but turn out amazingly. Just cut down a cardboard tube to the width that you want your bracelet to be. Then get some old magazines and glue on interesting colors and patterns from artwork found in the magazine. On top of the first layer, you might want to put letters or interesting illustrations that you find. Then cover the bracelet with a glue mixture (3 parts Elmer's Glue : 1 Part water) and let dry. Put on a few more coats to give it a protective and glossy layer. Make a Table Tennis Ping Pong Balls Holder and Dispenser - Table tennis / ping pong balls are always ready to ping pong into action when you store them in a convenient ejector-dispenser holder. This is a great de-cluttering crafts activity for those who have a ping pong table. All you need are a few items from your house and you are set to making this cool ping pong ball holder and dispenser. How to Make Simple Pinball Machine with Recycled Cardboard Tubes - This is a super cool crafts activity that we are going to do today. If you love playing pinball, then you will love making this simple machine…a pinball machine. Just recycle some old stuff from around your house … such as a cardboard box, and let the fun roll in….literally. Making New Years Eve Party Horns - Learn how to make this New Years Eve Party Horn with an old cardboard paper towel tube and tissue paper. Make a Moving Mayflower Ship - This is an adorable craft ... pull the string and the Mayflower moves both directions towards or away from Plymouth Rock using paper towel roll, paper, and drinking straws. Castle Pencil Holders - Make these castle pencil and pen holders with recycled cardboard tubes (paper towel rolls or toilet paper rolls). Easy Angel Christmas Tree Topper with Clothespins & TP Rolls- Easy Angel Christmas Tree Topper to Make : Arts & Crafts Ideas for Kids No Christmas tree is complete without a beautiful angel placed on top. This craft gives your children the opportunity to make their own Christmas angel ornament / Christmas tree topper. Divide and Organize Your Desk Drawers - Make this nifty drawer organizer by using tons of cardboard paper towel rolls and a little bit of wits. Stick in Cardboard Tube Ring the Stick Game - Make this fun game with a wooden stick and a cardboard tube. Napkin Holder Doll for Thanksgiving Dinner Table Decorations with Toilet Paper Rolls and Crepe Paper- This pretty doll will hold your napkins or cutlery for you at thanksgiving dinner. Today we are going to share an idea for making a ‘Happy Thanksgiving’ Dinner Table Napkins or Silverware Holder to use as a decoration at your Thanksgiving dinner table. Below you will find instructions for this Thanksgiving table decoration. Paper Towel Roll Napkin Rings - These add a decorative flare to your table design. US Flag Made from Paper Towel Rolls - Learn how to make this simple US Flag to use when celebrating and being patriotic...like at parades. Paper Towel Roll Sand Castles - Who makes sand castles with cardboard and paper towel rolls (along with the sand)? Well this craft will show you. Toilet Paper Roll Poinsettias - Make some beautiful Christmas Poinsettias with flattened toilet paper roll strips. Just paint them and stick them together to form a beautiful flower. How to Make Halloween Napkin Rings for Spooky Table Decorations with Toilet Paper Rolls and Ribbons- Are you looking forward to a special dinner at Halloween? Make some Spooky Spider Napkin rings to ” dress up” your table. Make a Cardboard Tube and Yarn Tote - Use some yarn to decorate a paper towel roll and make a handle to make a nice scissor and pencil tote. How to Make a Wood & Cardboard Tube Cup Catching Game - This is a fun boredom-buster type game...find out how to make it with the following instructions. Toilet Paper Roll Advent Calendars - Use this cool Advent Calendar to count down the days to Christmas. Cardboard Tubed String Puppets - Dance these puppets around the house with the string that holds it together and controls them. Christmas Candle Arrangements - Learn how to create this Christmas Candle decoration with a cardboard toilet paper roll, crepe paper, and a few other items. Abraham Lincoln to Make with Toilet Paper Rolls - - This is a fun and easy color, cut and paste craft that uses a toilet paper roll as a base to give the finished craft a three dimensional effect. Advent Tree : How to Make Advent Calendars Instructions -A fun way to count down the days until Christmas. Make this advent Christmas tree using toilet tissue or paper towel rolls. Angel Tubes -This adorable angel is made with a toilet paper tube. Baby Megg Egg Projects -With her paper tube body and glued-on features, this egghead family member will crack your kids up. Bald Eagle Toilet Paper Roll Making Instructions: Although this does make a great USA themed craft, it works for any bird and forest theme (we have bald eagles up here in Canada too). I love the toilet paper roll crafts that have wings. Basketball Court : Basketball ideas for children -Make this basketball court using toilet paper roll. Bat Napkins : Halloween Bat -Don’t throw away that empty paper towel roll! Make these adorable Halloween napkin rings for your holiday dinner or party. Bat Toilet Paper Roll -Make this bat from a toilet roll. BIG Paper Mache Bird -This rather large paper mache bird makes a great friend or a rather nifty pinata and was created wtih balloons, toilet paper rolls, tissue paper, glue, and more. Box Guitar : This is an easy way to make a guitar using an old shoe box or tissue box, rubber bands, scissors, a paper-towel tube, and a pencil. Bunny Egg Holders -Use our "Dress a Bunny" Stickers to make egg holders from cardboard tubes. Canada Day Wreath Patriotic Canadian Crafts for Children - - This toilet paper roll wreath provides a great way for your children to decorate the house for Canada Day. We actually hang ours outside (assuming it isn't raining) during our Canada Day barbeque. Canada Mobile - - This is a simple mobile made up of maple leaves and flags. We usually create our mobiles by using two straws or sticks taped or tied in a criss-cross (see picture) or by using one paper towel or gift wrap roll with all the pieces tied to it (this isn't as 3D a mobile, but is good for recycling). Cardboard Candlesticks - Turn paper tubes into candlesticks complete with shimmery flames. Cardboard Roll Binoculars - This shapes craft for toddlers allows the kids to be creative when they decorate their binoculars. Adults will need to do some of the steps to complete this kids craft project. Cardboard Roll Noise Maker Crafts- Don't throw away the toilet paper cardboard rolls as these make the perfect craft supply for noise makers. Cardboard Tube Angel -This lovely little angel is the perfect recycling craft for Christmas. She’s singing to the Heavens and wants you to join in! Cardboard Tube Bunny -Kids will love seeing these adorable bunnies adorn your holiday table. Cardboard Tube Bunny - Mr. Whiskers is a lot of fun to make and recycles some of those empty toilet paper tubes too. Cardboard Tube Christmas Wreaths -Help your kids make this unique Holidays wreath which will make for a great addition to your Christmas decorations! Cardboard Tube Lamb Crafts Activity with Cardboard Tubes - Hard to believe this adorable lamb came from a bag of cotton balls and a toilet paper roll! He’s cute and fluffy, so make one of your very own. Cardboard Tube Menorahs - - Make a Menorah out of Toilet Paper Tubes. You even get to be eco-friendly with this project! Cardboard Tube Moses : Bible Craft Ideas for Kids - This fun craft project is perfect for Sunday school or for celebrating Passover. Teach children the story of Moses and have fun while creating this cute figure from recycled materials. Cardboard Tube Pilgrims & Indians - - These cute little Thanksgiving characters are made from a paper towel roll and lots of imagination. They look hard but they are actually easy to make. Putting together a harvest family is one of many fun kid's crafts! Cardboard Tube Red Firecrackers - - A common decoration during Chinese New Year is a string of red firecrackers. Some believe that throwing firecrackers scares away evil spirits. Make a string of your own to display! Cardboard Tube Space Ships : Space Ship Crafts for Kids - You don't have to be a rocket scientist to build one of these svelte spacecrafts. All you'll need is the right stuff: cardboard, glue, tape, and a big dose of aeronautic creativity. Check Box Cameras -Instructions to make a pretend camera using a check box, toilet tisuse roll, and a few other supplies. Chick Toilet Paper Roll Craft : This is an easy cut and paste craft that utilizes a toilet paper roll to give it a three dimensional effect. You can use a piece of a paper towel roll instead, if you prefer. Chick Toilet Paper Roll Craft : Bird Crafts Activities for Kids This is a simple three dimensional chick craft that is fun for kids to make and play with. Christmas Candy Shakers -Take the toilet paper roll and stuff your candies in it. Then wrap your roll in any kind of wrapping paper and there you have your own candy shaker! Circus Clown Toilet Paper Roll Crafts - I've had this clown on my to do list for awhile and I've finally finished him! Clown Ring Toss : Clown Crafts Ideas for Kids - Liven up your child's birthday party with this easy clown ring toss game made from a cardboard tube and a little imagination. Craft : Squirrel in Tree - Using a paper towel roll, tissue paper, and a picture of a squirrel, you can make this adorable squirrel in a tree craft. Crocodile Toilet Paper Roll Crafts -This is a simple three dimensional crocodile craft good "just for fun" or a reptile theme. Daddy Deggster Egg Crafts Activity -With his paper tube body and glued-on features, this egghead family member will crack your kids up. Dalmatian Dog Toilet Paper Roll : Fire Prevention Crafts for Kids- - You can either make the Dalmatian with the fire hat (for a fire man's helper) or without. The Dalmatian toilet paper roll craft is a fun and easy cut and paste craft that uses a toilet paper roll as a base to give it a three dimensional effect. Easy Fold and Cut Star of David - You can use these to decorate wreaths, hang in a row to make a chain or hang a bunch from a paper towel roll wrapped in blue construction paper to make a mobile. Elf Toilet Roll Crafts -Elf craft made from a toilet paper roll. Fairytale Castle Crafts : Who could resist trying this gorgeous fairytale castle craft! Easy to make from cardboard tubes and others scraps, it makes a fantastic desk tidy which will make any child happy to sit down and do their homework. Fingerprint Fall Trees - - This fun autumn themed tree really stands up on its own and is a fantastic preschool crafts for fall. Kids will enjoy dipping their fingers in the different colored paints and making the leaves with their fingerprints. This simple craft is made with materials you most likely already have on hand, and our printable template makes this fall craft even easier to create. This toilet paper roll fall tree makes a great homemade fall decoration as well! Enjoy! Finger Puppet : Crafts Ideas with Toilet Paper Rolls - Transform a paper tube into an silly clown finger puppet. Firecracker Napkin and Utensil Holder -This festive project not only looks great on the table but it's functional too! By making this fun craft from cardboard tubes you will be recycling as well. Football Player Craft -This football player toilet paper roll craft makes a great project to occupy kids while parents are watching the game. Ghostly Halloween Wreath : Making Ghosts with Arts and Crafts Activities- This fun Halloween wreath is made with TP rolls. Grandpa Gregg Egg -With his paper tube body and glued-on features, this egghead family member will crack your kids up. Hippopotamus Toilet Paper Roll Craft : African Arts and Crafts Ideas for Children - This is a cute three dimensional hippo craft suitable for a jungle theme, mammals or animals theme, Africa theme or letter H theme. How to Make a Paper Plate Butterflyy - - Instructions for making a butterfly using a paper plate, a toilet tissue roll, and a few other supplies. Ibex (Wild Goat) Toilet Paper Roll Craft for Children - An ibex is basically a wild goat who lives in the mountains. I made the Ibex so that I'd have a Letter I toilet paper roll animal for the Alphabuddies section. Indian Corn Cobs - - Instructions to make a cob of Indian Corn out of a toilet tissue roll. Jesus Craft : Bible - It may seem a tad odd making Jesus out of a toilet paper roll, but I think the end result is quite nice. The craft is made with a toilet paper tube, a printer, a piece of paper, some crayons, scissors, and glue. I always prefer to use a heavy paper (like construction paper), but it isn't necessary. Paper Organizer Craft for Schools -This easy-to-make honeycomb-shaped wall shelf is great for holding tiny trinkets. Just add more tubes to show off a larger collection. Japanese Rain Doll -This tutorial shares how easy it is to make this Japanese rain doll out of cardboard tubes and paper. Karate Crafts - This "Karate Kid" craft is made with a toilet paper tube, a printer, a piece of paper, some crayons, scissors, and glue. I always prefer to use a heavy paper (like construction paper), but it isn't necessary. King TP Roll Crafts - 3 versions : King Queen Prince Princess Crafts for Kids - I've made a few different king templates. You can chose between a teen/early 20's young king, a stern looking middle aged king and an older king depending on the theme you're making the craft to go with. Lamb Toilet Paper Roll Craft Ideas -This is a simple three dimensional lamb craft that is fun for kids to make and play with. I thought scissors would be cute for a lamb to hold -- they are sheared (get a fancy hair cut) and their wool is used to make clothes, blankets and lots more! "Lenny" the Leprechaun Saint Patrick's Day -This is a fun and easy cut and paste craft for Saint Patrick's Day. It uses a toilet paper roll as a base to give it a three dimensional effect. Lincoln Hat Crafts -Abraham Lincoln, the 16th President of the USA, used to wear a black stovepipe hat. You can make a tiny version of Lincoln's stovepipe hat using a toilet paper tube and black construction paper. Lion Toilet Paper Roll Craft Idea for Kids - This is a cute three dimensional lion craft that is fun for young children to make and to play with. Make a Box Towns -This is an easy way to make a toy town using old boxes, cartons, colored paper, scissors, tape, paper tubes, and crayons. Mary Craft : Bible Story Craft Ideas for Children - Mary is made with a toilet paper tube, a printer, a piece of paper, some crayons, scissors, and glue (or tape). I always prefer to use a heavy paper (like construction paper), but it isn't necessary. 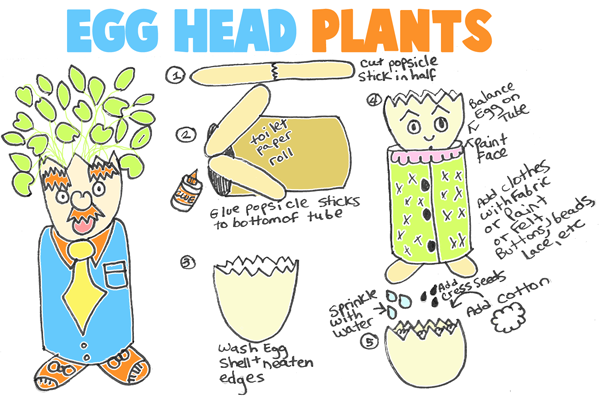 Mom Peggy Egg Crafts : TP Roll & Paper Towel Roll Crafts- With her paper tube body and glued-on features, this egghead family member will crack your kids up. Monkey Toilet Paper Roll Craft Idea for Preschoolers - This is a simple three dimensional monkey craft that is fun for kids to make and play with. Moose Toilet Paper Roll -This moose can be used for a Forest Animal, a Canada or a Rocky and Bullwinkle theme. Moses Toilet Paper Roll Craft - This is a simple three dimensional craft that is easy and fun for young children to make and play with. 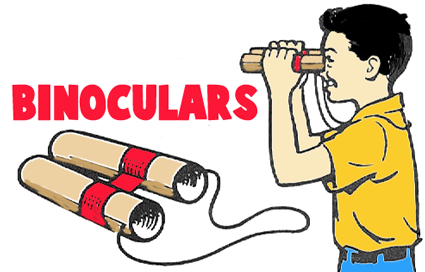 Multicolor Binoculars : Making Binoculars - Turn two rolls of cardboard into magical multicolor binoculars. A fun Columbus Day craft that kids will love to build and explore with - just like Dora! New Year’s Eve Noise Makers : How to Make Noise Makers Ideas for Children- My kids have yet to make it to midnight on New Year’s Eve, but this year my son is determined to stay up… we’ll see! So in preparation, we’re gathering our pots, pans, and noise makers for the big count down. We’ve been crafting these fun Homemade Noise Makers out of recycled paper rolls. Not-So-Scary TP Snakes : Snake - Everyone will have fun with this Not-So-Scary Snake make from a toilet paper cardboard tube. Nutcracker Toilet Roll -Nutcracker themed figure made from a toilet roll. Owl TP Roll Craft : Making Birds Arts and Crafts for Kids This is a fun and easy color, cut and paste craft that uses a toilet paper roll as a base to give it a three dimensional effect. Paper Christmas Trees -Miniature Christmas trees using a cardboard toilet paper roll, construction paper, and a few other supplies. Paper Mache Dinosaur Bone : You can make your very own dinosaur bone from a big cardboard tube, newspaper and flour. Paper Roll Skeleton : Make Spooky Skeletons for Halloween - Collect those toilet paper and towel rolls for a great holiday decorating project-- make paper roll skeletons for Halloween! Paper Towel Roll Snakes : Snake Arts and Crafts Activities - This is a craft and a fun toy all in one! Preschoolers design their snake and then they can take it for a “walk” by pulling it along with the yarn. Paper Tube Snowman -This snowman is fun to make for kids and makes a nice Gift for a friend or relative. Parrot Toilet Paper Roll Crafts - - These toilet paper roll crafts represent some of the birds Columbus and his men may have seen when they first landed off the coast of South America. Paper Tube Castle Crafts Instructions for Kids Preschoolers can use their imaginations decorating this castle! You can use sequins, glitter and whatever else you have on hand. You could even paint a paper plate blue for the moat around the castle. Party Popper Parade Instructions - Follow these directions and you can create party supplies using a toilet paper roll. Not only do these make colorful party decorations but they also double as party favors when you fill them with small treats. Peacock Fan Toilet Paper Roll Craft - This is a cute three dimensional peacock craft suitable for an India theme, birds theme, animals theme or letter I theme. Penguin Toilet Paper Roll Activity -Very easy, beautifu and fun. Pig Toilet Paper Roll Activities -This is a simple three dimensional pig craft that is fun for kids to make and play with. Pilgrim Toilet Paper Roll Craft for Children - - This is a fun and easy color, cut and paste craft that uses a toilet paper roll as a base to give it a three dimensional effect. Pilgrim Mouse - - This is a fun and easy color, cut and paste craft that uses a toilet paper roll as a base to give it a three dimensional effect. Pirate TP Roll Crafts Activities for Children - We're rather fond of pirates in our house. Occasionally we even dress up like them. The pirate is a cute and simple color, cut and paste craft that uses a toilet paper roll as a base to give it a three dimensional effect. Pumpkin Roll Toilet Paper Making- - Give your extra toilet tissue a festive look this Halloween. Quetzal with Toilet Paper Roll to Make - - The Quetzal is Guatemala's national bird. It lives in Central and South America and is near extinction. In ancient times, Aztec and Mayan people loved the beautiful feathers of this colorful bird. The feathers served as symbols of wealth and status. Rainsticl Easy Making Instructions - - According to South American legend, rainsticks are played to serenade the gods as a reminder that rain is welcomed. 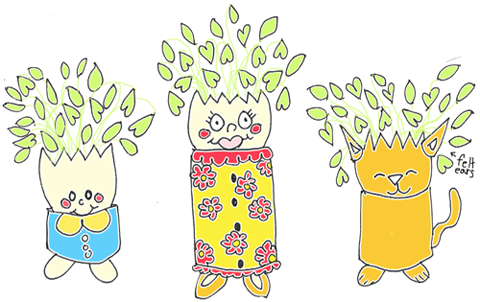 Rainsticks are traditionally made from hollow cactus wood, thorns and pebbles. Our version is made from a cardboard tube, tinfoil and popcorn kernels. Rain Stick Music - Make these rain sticks with dried beans, corn, or rice and a paper towel roll. Recycled Cardboard Tube Scarecrow - - This fun recycled craft made from a paper towel roll and scrap fabrics and felts is an adorable project for Fall. Gather the kids around, pull out the craft supplies and get cracking on your own scarecrows! Recycled Sea Life Creatures : Octopus Crafts for Kids - Make an octopus, squid and a sea anemone from recycled cardboard tubes. Rhino Toilet Paper Roll Activities - This is a simple three dimensional rhinoceros craft that is fun for kids to make and play with. I thought a horn would be a good thing to hold, since rhinos are most recognizable for the horn on their nose. Ribbon Wrapped Napkin Rings - Lend a cheerful touch to your Christmas dinner table with this Ribbon wrapped napkin rings craft. Since it uses paper towel tubes this craft also provides kids with a great introduction to the idea of recycling. Robot Racer Rubber Band Car - This site will show you how to build a Robot Racer. The robot racer is a fast, fun, easy-to-build elastic band car. The car uses recycled tubes, bottle tops and even recycled elastic bands for that eco-friendly feel. Enjoy! Ruth Craft Bible Story Craft Ideas for Children - Ruth is made with a toilet paper tube, a printer, a piece of paper, some crayons, scissors, and glue (or tape). I always prefer to use a heavy paper (like construction paper), but it isn't necessary. Shamrock Candle Making for St. Patrick's Day - This tp roll candle may improve your luck a bit (or at least brighten up your kitchen table!) Materials required are a toilet paper roll, printer, paper, scissors, crayons and glue. Shepherd TP Roll for Bible Arts and Craft Activities - I originally made this for the story of Cain and Abel, but you could use this craft for any story that requires a shepherd. Simple Recycled Butterfly - - In these days of recycling, crafters are looking for projects that incorporate this environmental consideration. Here is a way to recycle toilet tissue rolls, paper towel rolls and wrapping paper cardboard rolls. Size determines which one you choose. Snow Mobile - Showcase your favorite winter sports with this one-of-a-kind Snow Mobile. Recycle cardboard tubes and milk cartons into heart-warming art projects! Space Shuttles to Make with Easy Directions - Get ready to blast off! This Space Shuttle Craft is an easy project for any space enthusiast. If you don't have a paper towel roll just roll up a piece of white construction paper! Squirrel Toilet Paper Roll Making Directions- This is a fun and easy color, cut and paste craft that uses a toilet paper roll as a base to give the project a three dimensional effect. Squirrel TP Craft - This is a slightly different toilet paper roll craft - you actually smoosh the the cardboard tube inwards to make the cute shape of the squirrel. Find out how to with the following tutorial. Statue of Liberty Torch - Make a Statue of Liberty torch and crown with your kids and dress up for Fourth of July this year! All you need is some kitchen foil and a cardboard tube, and some imagination. Sunflower to Make with TP Rolls - - These giant sunflowers are made from small paper plates, a paper towel tube, sunflower seeds, and construction paper. You can make an entire bouquet of them for a great gift for summer decoration. Thanksgiving Character Puppets - - Make Thanksgiving characters from cardboard toilet paper rolls. This Little Piggy CD - Instructions to make a pig face out of old Cds and a bathroon tissue roll. Tiger Toilet Paper Roll - This is a cute three dimensional tiger craft that is fun for young children to make and to play with. Toilet Paper Roll Binoculars to Make - Hunt down some fun with these TP binoculars. 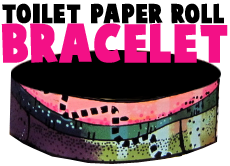 Toilet Paper Roll Bracelet This is a very simple, creative recycling project children will love. It's very quick to make and fun for kids of all ages. The best part is it's made with scraps most of us have around the house. Toilet Paper Roll Indian Hat Craft - - You won't believe how easy it is to make this fun Thanksgiving place card holder that looks like an Indian headband. Toilet Paper Roll Pilgrim Hat - - You won't believe how easy it is to make this fun Thanksgiving place card holder that looks like a Pilgrim's hat. Toilet Paper Roll Turkey - - This toilet paper roll turkey is a simple, but really cute Thanksgiving Day craft. Kids will enjoy cutting out the different color feathers of construction paper and putting the turkey together. Toilet Roll Advent Calendar : How to Make Advent Calendars Directions for Children - You can arrange this from 24 down to 1 (a countdown) or from 1 up to Christmas. Toilet Roll Ox - - This is our favorite Year of the Ox craft! He's easy to make but so effective - perfect for decorating the house for Chinese New Year this year! Toilet Paper Roll Walnut Squirrels - Make these adorable squirrels with toilet paper rolls, some felt, a walnut, googley eyes, a pom pom, and a few other items. Toilet Paper Roll Sharks - Make these sharks with toilet paper rolls...they come out great! Tooth Fairy TP Roll Ideas for Kids - This is a simple color, cut and paste craft that uses a toilet paper roll as a base to give it a three dimensional effect. Totem Pole Craft - - Make this craft using toilet tissue rolls. Totem Pole - - Made by the Tlingit Indians of the Pacific Northwest coast of North America. Traditionally, each Totem Pole tells the story of a Native American family's ancestral spirits and family history. Make a Totem Pole from a paper towel tube. TP Roll Parrot : Bird Crafts for Children This TP Roll Parrot is a fun and colorful Bird Craft for Kids, suitable for Preschoolers on up. This would also make a great Pirate craft. After all, what's a Pirate without his companion! TP Roll Scarecrow - This TP Roll Scarecrow is made from construction paper, markers and things you have lying around the house. It makes a cute Fall or Thanksgiving decoration! Toilet Roll Turkey - - Simple and cute - a quick and easy Thanksgiving craft for younger kids! TP Toilet Paper Roll Cow - Kids will love to make this toliet paper roll cow. The TP rolls make up the cow's head and body, and 2 egg carton sections make his legs. Cute and inexpensive! TP Toilet Paper Roll Frog Crafts Project - This adorable TP roll frog is a easy and inexpensive kids craft. If you don't have the 'google eyes' just cut out two circles from white paper and draw in the frog's eye's with a black marker! Turkey Fan Toilet Paper Roll Craft Activity This is a cute three dimensional turkey craft suitable for a Thanksgiving theme, farm theme, birds theme, animals theme or letter T theme. Tube Racers : How to Make a Racing Car from Toilet Paper Tubes - How can you turn a toilet paper tube into a hot rod? Take this idea for a spin. Uncle Sam Holding Flag 4th of July Making Instructions- This is a fun and easy color, cut and paste craft that uses a toilet paper roll as a base to give the finished craft a three dimensional effect. Uncle Sam Star Toss - Use recycled oatmeal containers and bathroom tissue tubes to create patriotic decorations AND a fun game for kids on the 4th of July. Kids toss felt red, white and blue stars through the mouth hole of the Uncle Sam. USA Friends - Make yourself one of about 100 possible Independence Day tp roll critters like Blue's Clues, Scooby Doo, Pikachu, a mouse, a hippo,... you get the idea! USA Patriotic Wreath 4th of July - This tp roll wreath provides a great way for your children to decorate the house for the Fourth of July or other patriotic American celebration. The diameter of the completed wreath is about 15 inches. This craft is fun for older children (and adults!) - Age 6+. Wizard Toilet Paper Roll This is a fun and simple color, cut and paste paper craft that uses a toilet paper roll as a base to give it a three dimensional effect. Wild and Wooly Sheep / Rams - Make these awesome sheep / rams with toilet paper rolls, cotton balls, Q-tips, tissue paper, pipecleaners, and tape. Wolf Toilet Paper Roll -This is a good craft to make for a number of themes, including the Three Little Pigs and Little Red Ridinghood. It is a simple cut and paste craft that uses a toilet paper roll as a base to give it a three dimensional effect. Wrapping Tube Track - - With just a few snips here and some duct tape there, an empty wrapping-paper tube revs back to life as a double track - the ideal venue for racing balls or toy cars, and one that's perfectly engineered for solo play. Zebra Toilet Paper Roll to Make-This is a simple three dimensional zebra craft for young children to make. It works well for a jungle theme, mammals or animals theme or letter z theme.